Someone who tends to catastrophize pain, or have a high fear of pain, is more likely to respond to pain in one part of the body by feeling pain in another part of the body that should not be painful. Here’s an example that illustrates what is occurring in this case. Imagine that you are remodeling your home and painting the walls. As you brush the paint onto the walls, the process may be tiring and at times a little awkward. But, if you are a healthy, injury free adult, it should not be painful. You don’t have to be ambidextrous in order to be able to use either hand to move the brush without pain. Now imagine that you fall off your letter and break your dominant arm. You go to the hospital and have the bone set and immobilized. The following day you decide to work on your paint job. As a person of habit, you attempt to pick up the brush with your broken arm. As you would imagine, the result is intense pain, as doing anything with a broken arm is difficult at best. You really want to get the job finished, so you attempt to use your non-dominant arm to continue painting. As you work, you notice that painting is more difficult than it was before your injury, and soon you feel pain in the uninjured arm. Confused, you wonder to yourself why the uninjured arm hurt so much after breaking the other arm? You might expect that painting with your non-dominant hand would be a little more awkward, and perhaps more tiring, than usual, but you would not expect it to be so painful. Research shows that pain is not necessarily proportional to the extent of tissue damage, nor is pain even necessarily dependent on tissue damage. How one thinks of pain can strongly influence how pain is experienced. Today, fear and catastrophize and of pain are two variables that have been widely researched. Catastrophize and refers to negative cognitive responses, not just a pain, but also to anticipation of pain. People who have this negative cognitive response attend to see pain as particularly threatening. They may also feel threatened by the experience of pain. Fear of pain occurs when one interprets pain related stimuli as threatening. We’ve long known that fear and catastrophize and of pain can exacerbate a painful experience. But we are beginning to understand that a stimulus which should not be painful can become so. The research on which this article is based did not involve breaking anyone’s arm or causing any other injury. Scientist used delayed onset muscle soreness, which is the discomfort felt in the muscles after unaccustomed activity, to simulate the effects of injury. Participants in the study performed strength training with one arm, while resting the other arm, in order to induce this unilateral soreness. Following the induced soreness, formerly non-painful stimulus (such as the painting with the uninjured arm in the example) became increasingly painful over time in those individuals that scored high on pain catastrophizing, and those who scored high on fear of pain. To put it another way, those who tended to fear and catastrophize pain were more likely to experience increased pain in response to otherwise non-painful stimulus over time after pain had been induced on the other side of the body. These findings demonstrate increased pain to previously non-painful stimulus, only after injury to another part of the body. Why does this occur? 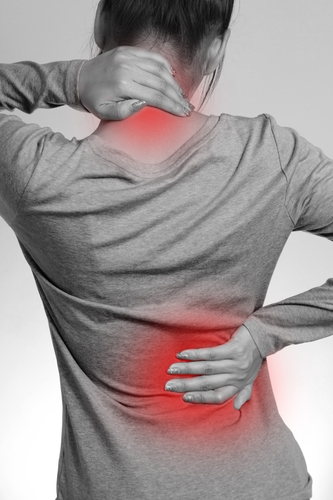 One theory is that injury can increase pain sensitivity through the entire body. We know the pain influences the central nervous system in a way that reduces the threshold needed for a stimulus to be felt as painful. In other words, it takes less stimulus to induce pain. As a result of the injury, the sensitivity of those neurons responsible for transmitting pain signals in the central nervous system increased, making the subject more sensitive. This occurred not just in response to things that should hurt, but also things that would not hurt otherwise. Another theory points to learning generalization. Generalization suggests that breaking one arm causes one to associate pain with use of that arm. Using similar movements with the other arm cause the expectation of pain to transfer from the injured arm to the injury free arm. The mere expectation of pain, this theory suggests, could aggravate even non-painful stimulus in such a way that it becomes painful. These findings suggest that the way you think about pain, specifically how much you either catastrophize or fear pain, increases your sensitivity to other stimuli. However, it is not yet clear whether the process is due to generalization, sensitization, or something as yet unidentified.